Peter Taylor, kite expert, explains how the draco was made to produce a noise. With Tim and Valerie looking after the head and tail, my contribution to the project was to investigate the noise made by the draco. Unfortunately there is very little direct evidence for the nature of the noise or how it was created, so this element of the reconstruction was very experimental. I was hoping that the Niederbieber draco head would contain some clues  some internal mounting plates or holes for example  but that proved not to be the case. But Ill come back to this later! We found nothing about how the draco sound was made, apart from a much later mention of reeds. Descriptions of the sound varied from whistling through hissing and eerie. Descriptions of when the noise was made varied from on parade to much movement. Were looking for solutions with specific acoustic properties; it has to produce resonance which can be excited at low pressure and in a compact structure. A high pitch noise would be ideal  low pitch would tend to get lost in the cavalry noise. We explored a number of different possibilities. Is it possible that the head itself could be responsible for the noise? Its an attractive theory, but unlikely to work. The fabrication process produces a structure which isnt easy to resonate. You might get a low-level noise from wind moving over the teeth, but it would not be nearly loud enough at the speeds we want. There is no evidence for resonating structures inside the head  and none of the reconstructed heads have made a noise. The tail does make a noise  a combination of fabric rustling and streamers flapping. But it isnt especially loud and it doesnt project. Whistles and flutes were known in Roman times  drill flutes were used by the army. They can be made to work at low pressure, they are compact and can produce a noise that carries well - and is pitched above cavalry noise. Is it possible that reeds were used to create resonance? Maybe, but you would still need a resonant chamber of some kind and our target speeds would not create enough airflow to make this work. Musical instrument makers said no way. We looked at a number of possibilities for using string. Aeolian (wind) harps can produce loud noise, but are really too big to be a practical solution. Its possible to make much smaller harps but they are not loud enough. Moving from a round string to a flat ribbon gives much more volume for a given size. Either way, the sound produced is a poor match for our whistle/hiss/eerie goal. We did consider the possibility that string resonators might have been fixed directly to the draco head  between the teeth for example. But the surviving head has no evidence for this idea. Another wind-powered noise-maker uses rotating vanes  we rejected this as anachronistic. We explored the idea that wind flowing through the draco head might excite a column of air in a hollow tube  an organ pipe or didgeridoo effect. It might work, but sources indicate that the draco head was mounted on a spear or spear shaft. From all of this the flute approach seemed the strongest candidate. For a given size they will produce by far the loudest noise and are consistent with the technology available. 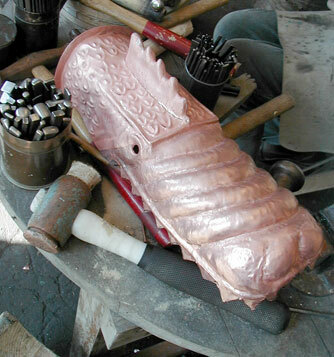 Mid morning on day 3 we were able to start experiments with the flutes mounted inside the draco head. The original plan was to mount them on a sound board  for speed we used the trusty BluTack  hardly authentic, but enough for a test run. 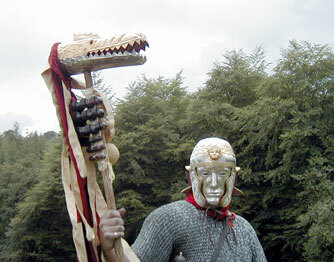 First tests were with the head alone  the tail wasnt ready at that stage. This didnt work at all well; it was much quieter and we needed more speed (20 mph + ) to get the flutes working at all. The problem was air turbulence  or sheer lack of air flow. Either way, adding more flutes would make matters worse, not better. And of course we needed good airflow through the head to inflate the tail. The obvious solution was to mount the flutes externally. But our assumption had been that the noise maker would be inside the head - and I wasnt quite ready to abandon that approach. In the end, a fresh look at the evidence with the Time Team crew swung it. Assuming the nose maker was organic and inside the head, it would of course have long-since decayed. But the decay should have left some form of residue. The lack of residue suggests that the noise maker was not inside the head. With no time left for further experiments, we decided to go for broke and mount the remaining whistles on battens that would fix to the spear shaft with leather thongs. No testing, no fine-tuning. From here it is straight into filming. The first couple of runs were not encouraging; the crew wanted to film against a backdrop  which meant downwind, the worst possible direction. Into the wind, things start to get better, but for the first few runs Alan (Larsen) is still trying to find the best way to control the whole assembly; the draco head is heavy, the tail pulls in the wind, and the flutes need to be angled correctly to get the best sounds. We are getting sound from the large flutes  but nothing yet from the small sets. 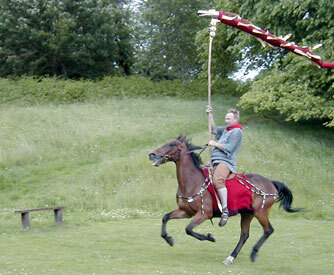 Finally, good results; riding into the wind, the small flutes kick in and sound becomes a wail. Later we find out the sound was easy to hear over 200 metres away. What next? Theres obviously potential for more research. Some representations of dracos show a much more open mouth style  which might have worked better with the internal flutes. From our experiments though, I think theres a strong case for flutes and for mounting them externally  even if that was an in-the-field modification. Click here for the website of the original 2005 Time Team episode. Making the Time Team Draco is Copyright � 2005, Peter Taylor. All rights reserved. Used with permission. The head of the draco. 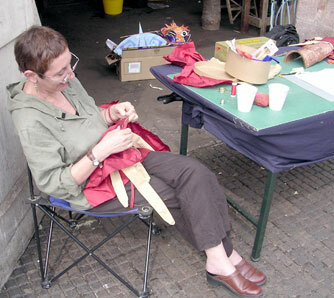 Valerie Hancorn, a kite-maker, making the tail. Alan Larsen with the draco.